Use a paper towel to dry any excess moisture from the fish fillets. Cut each fillet in half lengthwise, and into fourths widthwise. Depending on the size and thickness of each fillet, you should be left with about 12 pieces or poppers per fillet. Spread the flour and Panko crumbs out on 2 separate flat plates. Set aside. Crack the eggs in a separate bowl and lightly beat until the whites and yolks are thoroughly mixed. You may also add a few tablespoons of water to the eggs to thin them out, if desired. Flour each popper, being careful to fully coat each piece of fish. This is important for two reasons: first, the flour continues to absorb moisture from the fillet, making it crispy when fried. Second, this base layer makes it easier to coat the fish with the egg. One by one, dip each popper in the egg and then immediately roll in bread crumbs to coat. Prepare a large plate or serving tray, lining it with paper towel to absorb extra oil when the fried fish is transferred from the pan to the plate. Pour 1/4 cup of oil in a large pot over high heat. Once the oil is hot, carefully drop in 1/3 of the breaded poppers. Given the size of the individual pieces, they will fry up quickly, so be sure to stay by the stove and carefully monitor the cooking. Once the first batch of fish is fully cooked, remove from oil and set on the lined plate or tray. Remove the pot from heat and clean the pan. Add the other 1/4 of oil, heat and fry the second batch of fish. Repeat. It’s important to clean the pan before adding each new batch of fish, since the crumbs tend to burn and change the color of the oil. Serve with lemon juice, salsa and fruit. Enjoy! You may also use frozen fish, which is generally more budget-friendly. Just be sure to fully thaw out in the refrigerator at least 24 hours in advance before cooking. 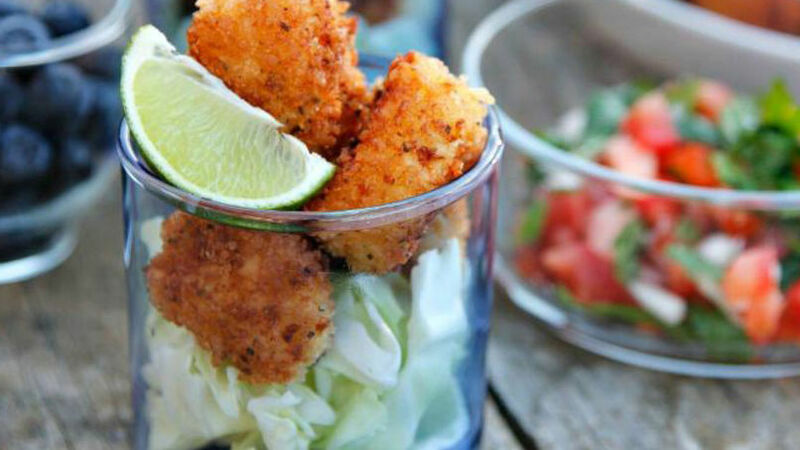 The fish poppers recipe I am sharing with you today is perfect for adults and kids alike. Your kids will love how crispy each bite is on the outside, and just how tender they are on the inside. The size of these poppers is perfect for little hands. Serve with lemon juice, pico de gallo (without chili peppers when serving youngsters) and fresh fruit such as blueberries or watermelon. Best of all, you only need 5 ingredients and 1 hour to prepare a dinner that will bring the whole family to the table.